I have never cared for the Human Rights Campaign (HRC). 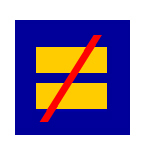 On a superficial level, I really dislike their equal sign logo (modified above for me by Art Fag City) which is designed to be as un-gay as possible. I remember a queer American friend, who lives in Europe, visiting around the time of the NYC GOP convention in 2004. He had no idea what the little blue = stickers were that some protesters where wearing. Allegedly a gay rights lobbying organization, it has become so entrenched in the DC lobbying mindset that it is not merely ineffectual, it is actually harmful to gay rights in America. I am no fan of Charles Schumer, given his vote for the Defense of Marriage Act. A Jewish New Yorker representing Park Slope making an anti-gay vote? Yeah, that'll get you the Christian Right vote. However, when the HRC endorsed Al D'Amato over Schumer in 1998, I was shocked. Their newest outrage? They have endorsed Joseph Lieberman for the Senate, even before the primary. Thanks to his snuggling up to the GOP and Bush on matters ranging from the Iraq War to the PATRIOT Act, he actually stands a chance of losing the primary to Ned Lamont. Guess which of the two is more pro-gay? Lamont. Of course, the HRC always argues this about realpolitik, or about preserving access, but ultimately they are working against the interests of the people they supposedly represent. He also explains why Ned Lamont is a good candidate for the gay community, so go take a look. One more post worth reading on the subject is Howie Klein at Huffington Post. Note: I use gay above, but I mean it more in a general sense of queer. I don't feel like listing a number of groups that follow under that umbrella, and I'm not offended by the word queer, but it seems to make some people (including my fellow homos) squeamish. This page is an archive of entries in the Queer category from June 2006.